Download "3. 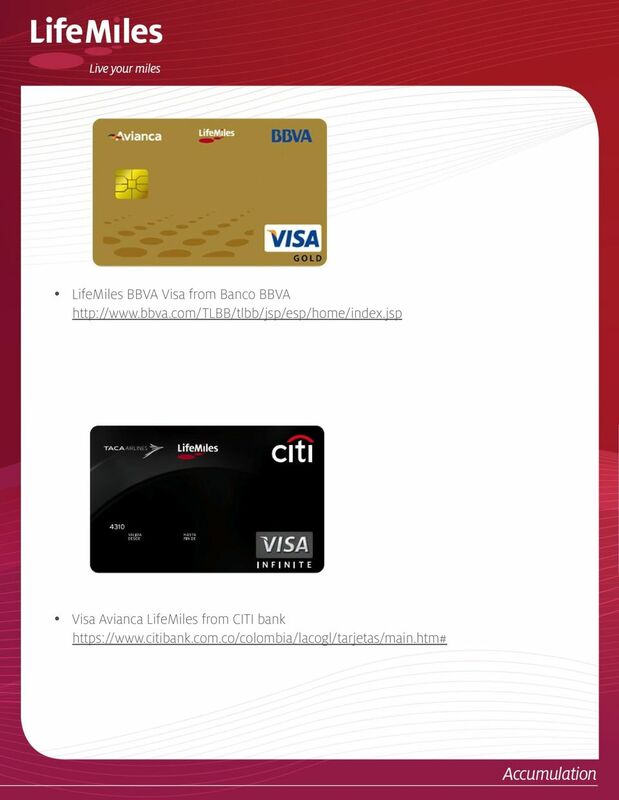 Earning on Avianca flights 3.1. Base Miles 3.2. Bonus Miles for Fare Family 3.2.a. 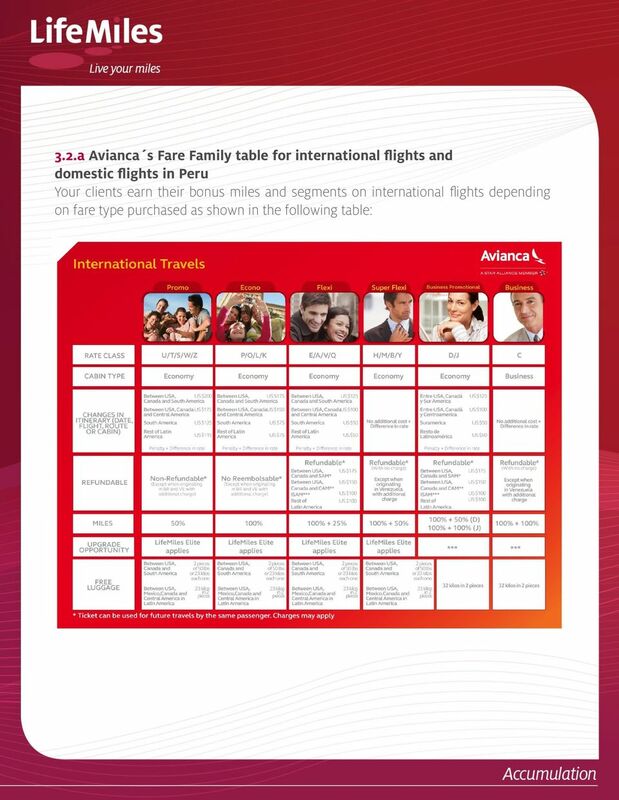 Avianca Fare Family table for international fights and domestic"
3 Accumulation in LifeMiles Our goal is to make sure that our members enjoy their miles as much as possible, which is why we have a vast network of partners with whom they can earn LifeMiles, even through their daily activities. Communicate to your clients that LifeMiles has partners operating in many countries, and in some cases, worldwide. This includes airlines such as United and Lufthansa, hotel chains like Sheraton and Marriott, car rental companies like Hertz and many other innovative commercial partners whose products or services are not necessarily related to travel, such as spas, department stores, restaurants, and many more. Suggest that your clients regularly visit our LifeMiles.com website to see our newest partners. LifeMiles has hundreds of commercial partners operating locally and while the network is larger in some countries than others, we are continually working to add new businesses to our network to multiply the chances of earning miles. 3. 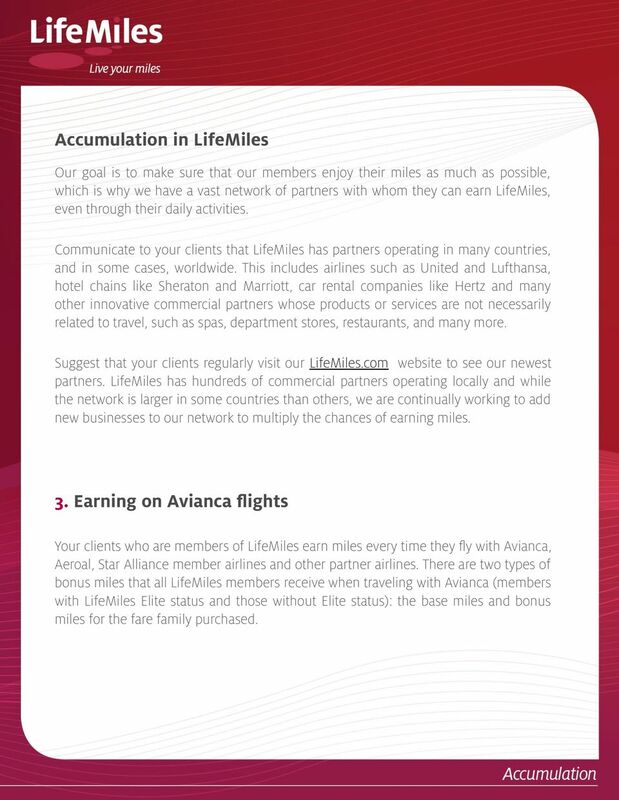 Earning on Avianca flights Your clients who are members of LifeMiles earn miles every time they fy with Avianca, Aeroal, Star Alliance member airlines and other partner airlines. 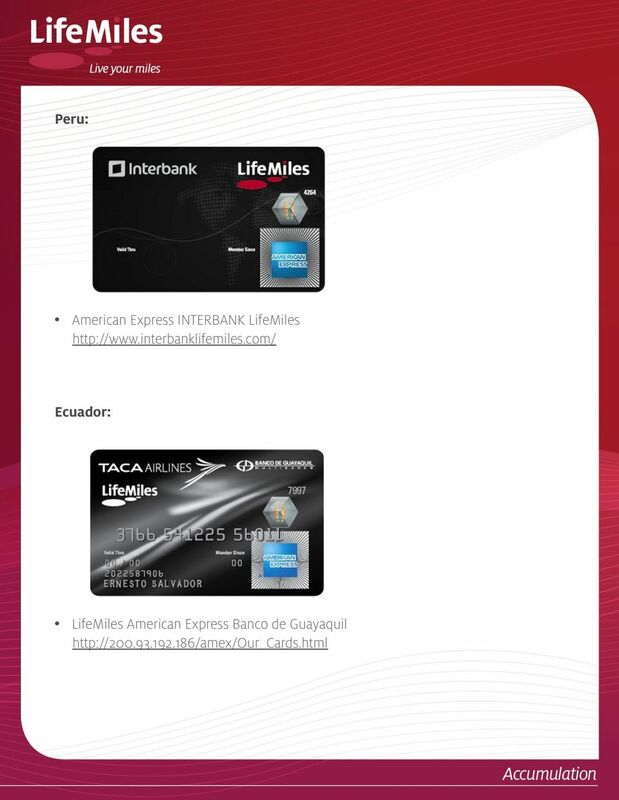 There are two types of bonus miles that all LifeMiles members receive when traveling with Avianca (members with LifeMiles Elite status and those without Elite status): the base miles and bonus miles for the fare family purchased. 4 3.1. 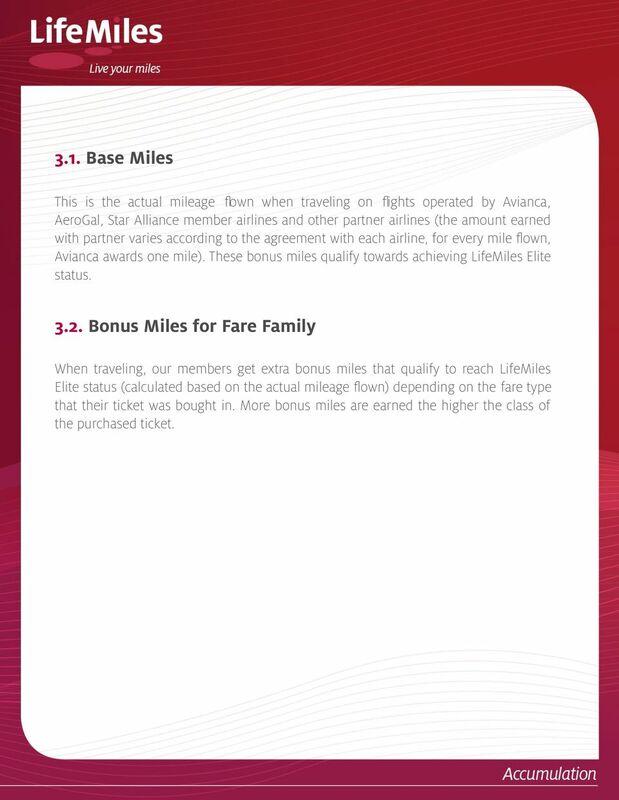 Base Miles This is the actual mileage fown when traveling on fights operated by Avianca, AeroGal, Star Alliance member airlines and other partner airlines (the amount earned with partner varies according to the agreement with each airline, for every mile fown, Avianca awards one mile). These bonus miles qualify towards achieving LifeMiles Elite status Bonus Miles for Fare Family When traveling, our members get extra bonus miles that qualify to reach LifeMiles Elite status (calculated based on the actual mileage fown) depending on the fare type that their ticket was bought in. More bonus miles are earned the higher the class of the purchased ticket. 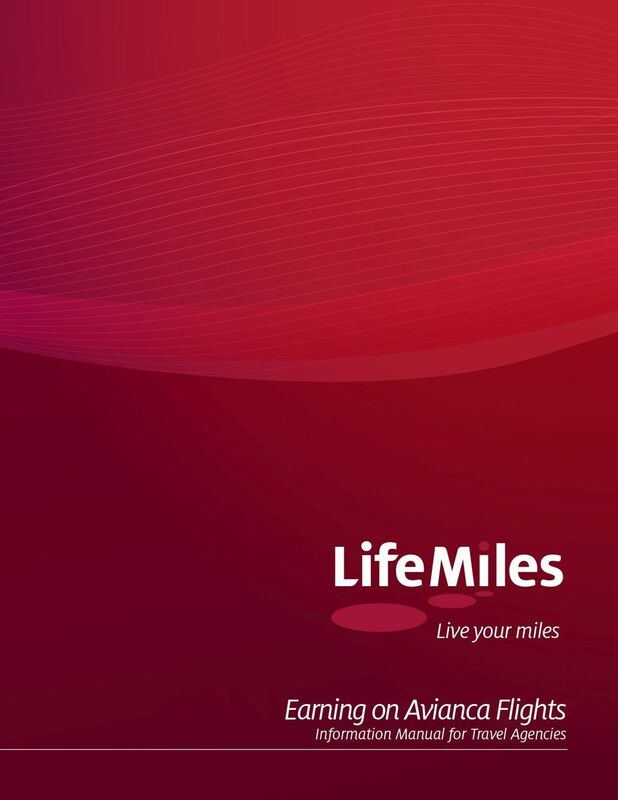 6 3.2.b Avianca s Fare Type table for domestic flights in Colombia For routes within Colombia the LifeMiles members earn miles according to the table below: 3.3. 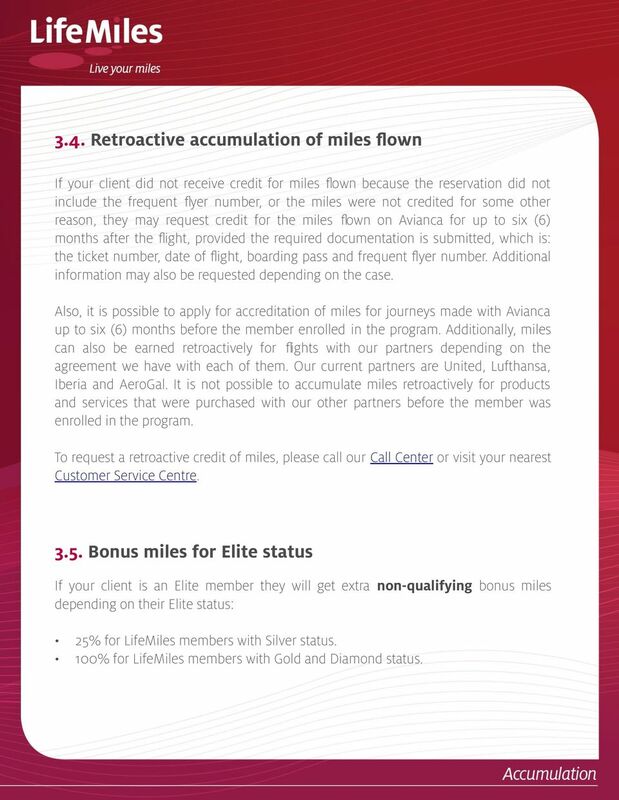 Qualifying segments In LifeMiles we also count each segment that your client fies with Avianca, to reach LifeMiles Elite status. It is very important that you help your client achieve Elite status by letting them know that the highest fares receive double segments, even in Economy Class. 7 3.4. Retroactive accumulation of miles flown If your client did not receive credit for miles fown because the reservation did not include the frequent fyer number, or the miles were not credited for some other reason, they may request credit for the miles fown on Avianca for up to six (6) months after the fight, provided the required documentation is submitted, which is: the ticket number, date of fight, boarding pass and frequent fyer number. Additional information may also be requested depending on the case. 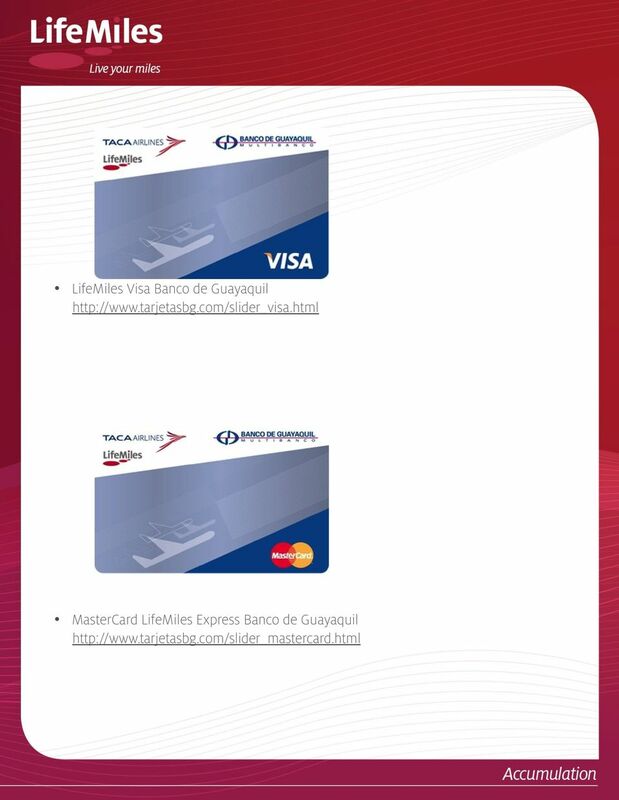 Also, it is possible to apply for accreditation of miles for journeys made with Avianca up to six (6) months before the member enrolled in the program. Additionally, miles can also be earned retroactively for fights with our partners depending on the agreement we have with each of them. Our current partners are United, Lufthansa, Iberia and AeroGal. It is not possible to accumulate miles retroactively for products and services that were purchased with our other partners before the member was enrolled in the program. To request a retroactive credit of miles, please call our Call Center or visit your nearest Customer Service Centre Bonus miles for Elite status If your client is an Elite member they will get extra non-qualifying bonus miles depending on their Elite status: 25% for LifeMiles members with Silver status. 100% for LifeMiles members with Gold and Diamond status. 9 3.9. LifeMiles e-store The LifeMiles e-store is an online shopping engine that allows the member to accumulate LifeMiles while shopping online at stores such as Nordstrom, Macy's, Apple Store, among hundreds of others. Mention this channel to your clients and help them start to earn LifeMiles while shopping online with the vast variety of participating stores. After a purchase has been made, the supplier will send a confrmation to the LifeMiles e-store and we will calculate the accumulated LifeMiles. This process can take up to 40 days to be shown on the LifeMiles e-statement. Visiting the LifeMiles e-store is easy! The steps are: 1. Visit our LifeMiles.com website before starting to shop. 2. The member should then log into their LifeMiles account using their frequent fyer number and password. Once they have entered their LifeMiles account, they can click on the drop down menu "Earn" and select "LifeMiles e-store." They will then be redirected to the page showing the hundreds of participating merchants divided by category. They can then select which store they want to visit and will be redirected to the page of the selected store. For miles to be accumulated the member must enter the store s page via the LifeMiles.com website. 10 Making purchases The LifeMiles e-store window will provide the member with the option to search for vendors of their choice by category or alphabetically. When they choose the store they want to visit, they should click on the name of the store and they will be automatically redirected to the vendor s website. 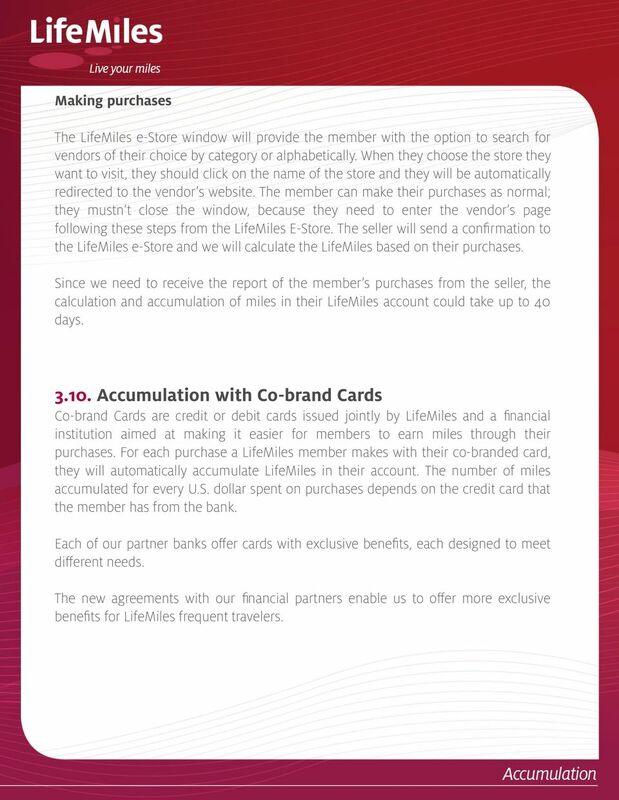 The member can make their purchases as normal; they mustn t close the window, because they need to enter the vendor s page following these steps from the LifeMiles E-Store. The seller will send a confrmation to the LifeMiles e-store and we will calculate the LifeMiles based on their purchases. 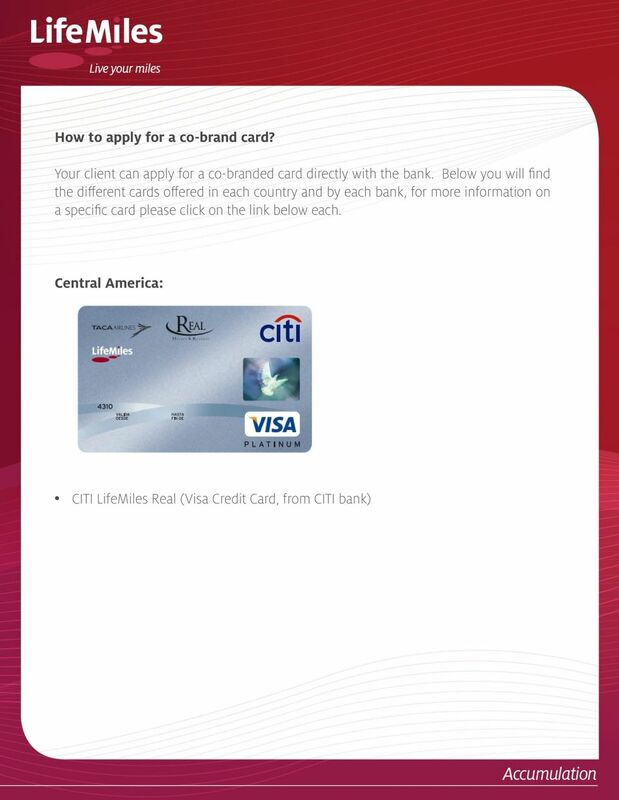 Since we need to receive the report of the member s purchases from the seller, the calculation and accumulation of miles in their LifeMiles account could take up to 40 days Accumulation with Co-brand Cards Co-brand Cards are credit or debit cards issued jointly by LifeMiles and a fnancial institution aimed at making it easier for members to earn miles through their purchases. For each purchase a LifeMiles member makes with their co-branded card, they will automatically accumulate LifeMiles in their account. The number of miles accumulated for every U.S. dollar spent on purchases depends on the credit card that the member has from the bank. Each of our partner banks ofer cards with exclusive benefts, each designed to meet diferent needs. The new agreements with our fnancial partners enable us to ofer more exclusive benefts for LifeMiles frequent travelers. 18 FAQ 1. What other options are there for earning miles? 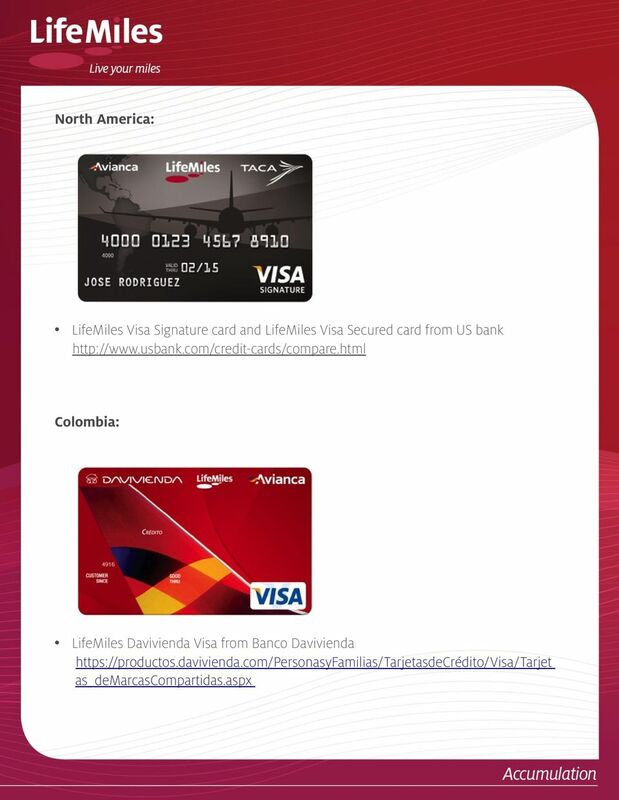 In addition to earning miles through Avianca fights, we have an extensive network of allied airlines, commercial and fnancial partners, such as hotels, car rentals, restaurants, banks ofering co-brand credit and debit cards, and magazine subscriptions among many others. Our airline partners are: AeroGal, Iberia and Star Alliance member airlines. It is also possible to earn LifeMiles through online purchases made via any of the hundreds of participating stores by entering their website through the LifeMiles e-store. 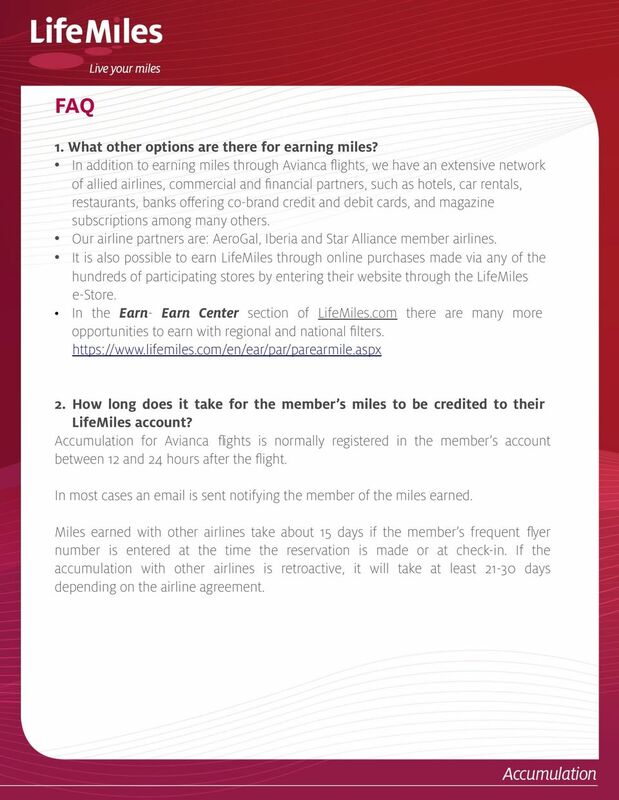 In the Earn- Earn Center section of LifeMiles.com there are many more opportunities to earn with regional and national flters How long does it take for the member s miles to be credited to their LifeMiles account? Accumulation for Avianca fights is normally registered in the member s account between 12 and 24 hours after the fight. In most cases an is sent notifying the member of the miles earned. Miles earned with other airlines take about 15 days if the member s frequent fyer number is entered at the time the reservation is made or at check-in. If the accumulation with other airlines is retroactive, it will take at least days depending on the airline agreement. 19 3. 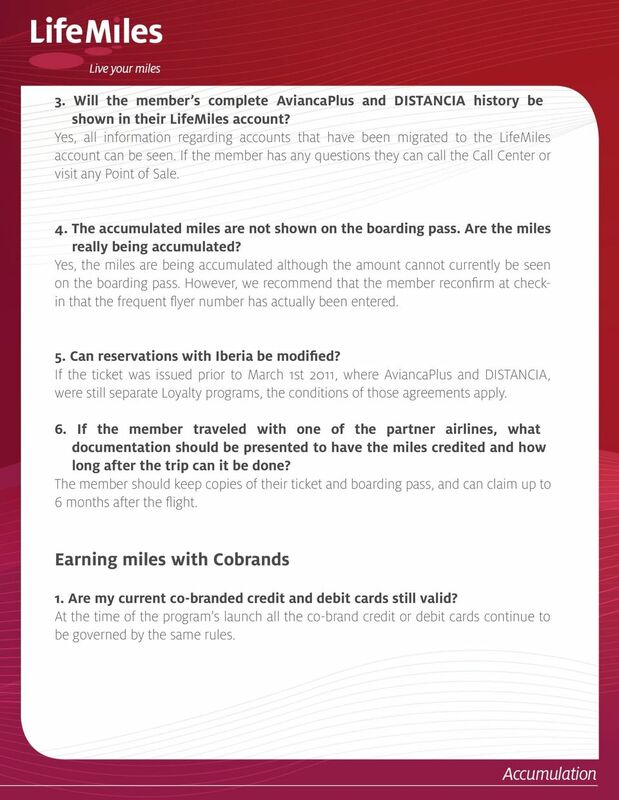 Will the member s complete AviancaPlus and DISTANCIA history be shown in their LifeMiles account? Yes, all information regarding accounts that have been migrated to the LifeMiles account can be seen. If the member has any questions they can call the Call Center or visit any Point of Sale. 4. The accumulated miles are not shown on the boarding pass. Are the miles really being accumulated? Yes, the miles are being accumulated although the amount cannot currently be seen on the boarding pass. However, we recommend that the member reconfrm at checkin that the frequent fyer number has actually been entered. 5. Can reservations with Iberia be modified? 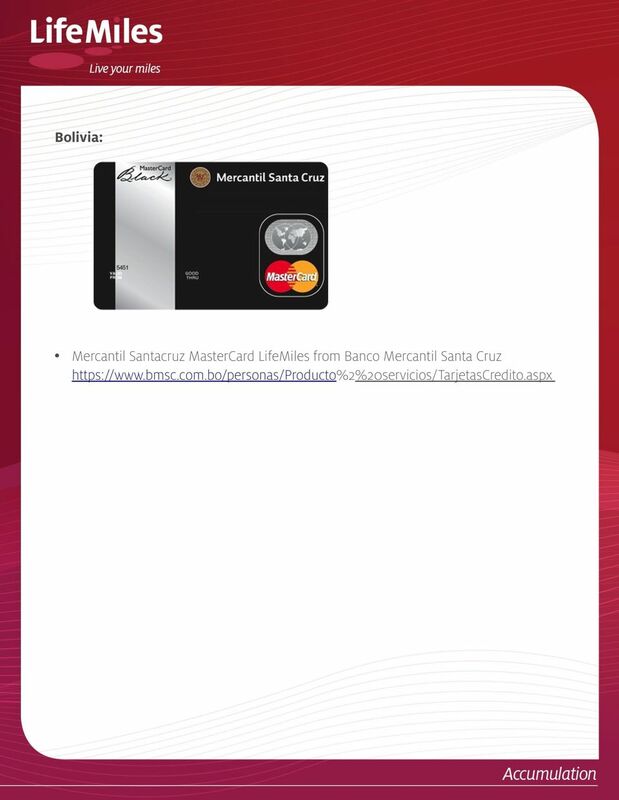 If the ticket was issued prior to March 1st 2011, where AviancaPlus and DISTANCIA, were still separate Loyalty programs, the conditions of those agreements apply. 6. If the member traveled with one of the partner airlines, what documentation should be presented to have the miles credited and how long after the trip can it be done? The member should keep copies of their ticket and boarding pass, and can claim up to 6 months after the fight. Earning miles with Cobrands 1. Are my current co-branded credit and debit cards still valid? At the time of the program s launch all the co-brand credit or debit cards continue to be governed by the same rules. A card built to put your money to work. Welcome to your Citi Dividend World MasterCard. If you have questions about how Banner Bank s TruRewards program works, you ll find the answers here. Frequently Asked Questions If you have questions about how Banner Bank s TruRewards program works, you ll find the answers here. How TruRewards works How much does it cost to participate in TruRewards? Concur login 2. Assigning travel assistant/self assigning 3. Making a travel reservation 4. Booking air 5. Booking car 6. A card built to put your money to work. Welcome to your Citi Dividend World Elite TM MasterCard. Guide to PanAm Agent and Online Booking Tool Services! HADIAH PLUS FAQ. BIBD Debit cardholders will earn Hadiah Points for retail purchases inclusive of online transactions. 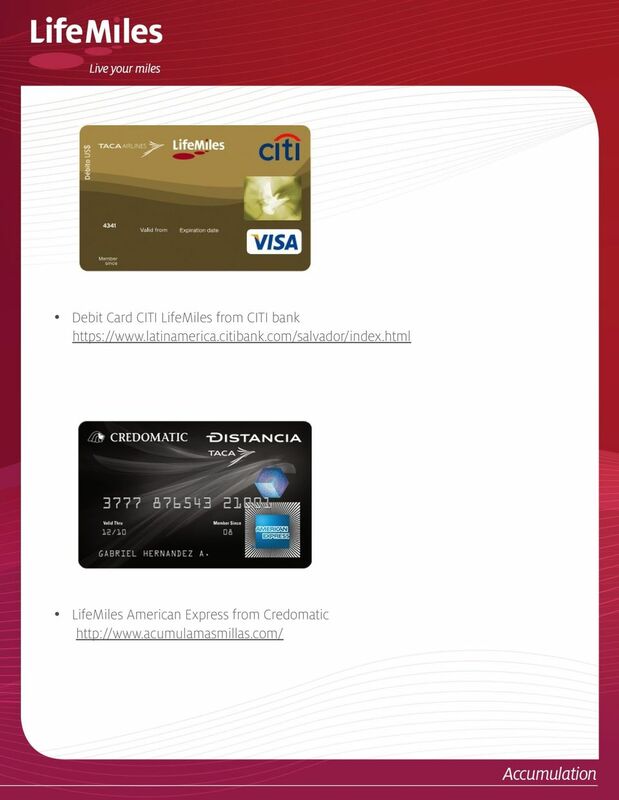 Card Services Rewards and Card Services Qantas Rewards Program Terms and Conditions February 2012 Contents Page 1. Definitions 2 Chapter One 2. Participation and Agreement 4 3. Awarding of Points 4 4. This version shows the previous user interface. Though the home screen is different in the newest user interface, most procedures and processes remain the same. Videos are available in the training toolkit. Discover the benefits of being a CIBC Tim Hortons Double Double Visa * Cardholder.